DraftCat B2B was created in order to facilitate the communication between WWMC, and its business partners in Poland and overseas. The main purpose for introducing the system was to shorten the time of realising the orders and, by that, to increase their rentability. Learn about the functions of DraftCat B2B – an excellent tool for creating functional models of web services and for project management! You can easily create interactive models of RWD services encoded as HTML - you do not have to have any knowledge in programming and to install any additional software! It is enough to have a simple computer and Internet access. Your clients will be able to quickly make orders on your website thanks to efficient and easy to use tools. DraftCat B2B makes it possible to specify the object of the order and to determine the object of the order and to determine the price and time of realisation. You can effectively manage projects - give them a particular status, comment and assign roles to members of your team. You have all files related to the project in one place - starting from the first versions of the project to source files and invoices. You can also access the entire history of realisations, which facilitates e.g. the explanation of disputable situations. 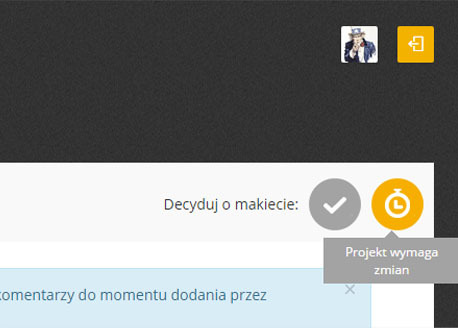 An unreliable system of notifications will allow you to react quickly to any changes related to the project (e.g. ordering party’s suggestions). In DraftCat B2B we know that more does not necessarily mean better. That is why we give you a perfectly composed set of tools that will really facilitate the work for you and for your team. Comfortable marking of changes in projects and adding comments. Possibility of uploading files in popular formats - JPG, PNG. A functional chat facilitating communication among team members. Easy access to all files regarding the projects. A set of elements making it possible to create functional models of web services. Possibility of granting an online access to interactive models, automatically encoded in HTML. A system of mail notifications making the process of order realisation more efficient and time effective. Assigning users to particular projects and granting them access to the system. It is possible to negotiate prices and dates concerning the orders. Quick access to full history of project realisation. Automatic issuance of invoices upon completion of the order and sending them in EDI standard. 1. Is any special software necessary to use DraftCat B2B? In fact, it is enough to use a simple computer and Internet access - it is not necessary to install any additional software. 2. Is it necessary to know how to use the software in order to comment on models and projects created with DraftCat B2B? No. Using all tools is very simple and does not require any special skills. 3. In what countries can you use DraftCat B2B? In fact, the only limitation is Internet access, one can then say that it can be used everywhere. 4. Is using DraftCat B2B free of charge? Sure - using our application costs nothing, as we share it with our business partners completely free of charge. DraftCat B2B has led our company to a totally different level of communication with the clients. Now all projects are realised more quickly than ever before. Since we started using DraftCat B2B, the amount of time lost on communicating with contractors and subcontractors has dropped by more than 30%. We were using several tools facilitating online communication but DraftCat B2B is absolutely the best - you can believe me. DraftCat B2B has everything that I expect from a system of online cooperation: easiness of use, well-planned options and reliability. Do you want to know more on the functions of DraftCat B2B? Contact us by mail or by phone - our consultants will be happy to answer all your questions! we will get in touch with you as fast as possible. Message wasn't sent. Correct inputs maked with red color. Copyright 2013 DraftCat. All rights reserved.